Smiley's Cancellation Policy: Please give us at least 48 hours notice if you would like to cancel your reservation. Cancellations made less than 48 hours in advance of check-in will be charged the full amount of your first night's stay. Room Rates: are subject to change, may be different on other booking sites and are based off the following standard rates: Friday, Saturday & Holidays: Queen Rooms: $175 plus tax; Large Rooms: $225 plus tax. Sunday & Thursday nights: Queen Rooms: $155 plus tax; Large Rooms: $200 plus tax. Mid-Week Mon, Tues, Wed Specials: Queen Rooms: $135 plus tax; Large Rooms: $175 plus tax. All rates are based on double occupancy and additional guests must be disclosed prior to check-in. Failure to disclose pets and or additional persons is considered defrauding an innkeeper. California Penal Code Section 537(a) PC makes it a crime to defraud an innkeeper. Taxes: 14% Marin County Transient Occupancy Tax (TOT) is not a tax on the business operator; it is collected by the operator from the transient occupant on behalf of the County. The Transient Occupancy Tax (Hotel, Motel or Bed Tax) is authorized under State Revenue and Taxation Code Section 7280, as an additional source of non-property tax revenue to local government. As of Jan. 1, 2019, Voters increased the TOT tax rate to 14% for lodging in West Marin. Payment and Terms at Check-in, Check-out: Full payment for your stay is required at or before the time of check-in. In addition, a signed and completed “One Time Credit Card Payment Authorization Form” must be on file which authorizes Smiley’s Saloon & Hotel LLC to charge your credit card for incidentals such as in-room purchases, excessive damages beyond normal wear and tear and replacement of missing inventory. Even if paying by cash, a credit card must be on file for your reservation. This is permission for a single transaction only, and does not provide authorization for any additional unrelated debits or credits to your account. Smiley’s Saloon & Hotel LLC has the right to charge any damages, fines, or deficiencies to the credit card for a period of up to and including 30 days from the date of stay. Pets: Smiley’s guest rooms are pet friendly, but only service animals are permitted inside the saloon. In addition to our pet fee, you will be charged for any excessive damage to the hotel’s property or other guests caused by your pet including stains, fleas and disorderly behavior. Do not leave pets in your room unattended. Any discounts resulting from complaints about your pets(s) behavior will be charged to you upon departure or thereafter. Noise and Quiet Hours: Live music in the Saloon often results in some excess noise (and fun) later into the evening up to 2am. At this time, Smiley's rooms aren't suitable for children or for folks in need of total peace and quiet. Our hotel walls are old, thin and not soundproof. We ask that guests observe quiet hours in the hotel quarters between 10pm and 8am. Minors: all children under the age of 18 must be accompanied by an adult. No one under the age of 21 is permitted in the Saloon at this time. Parking: Smiley’s Saloon & Hotel LLC assumes no liability for any damage or loss to vehicles, auto accessories or articles left in your car while parked on the Smiley’s Saloon & Hotel premises. Accessibility and Special Needs: Smiley’s Saloon & Hotel is a historic building and not wheel chair accessible. We will make every reasonable effort to provide an equal opportunity for everyone to enjoy our services and amenities. All of our guest rooms require travel up stairways through narrow entrances on uneven terrain. 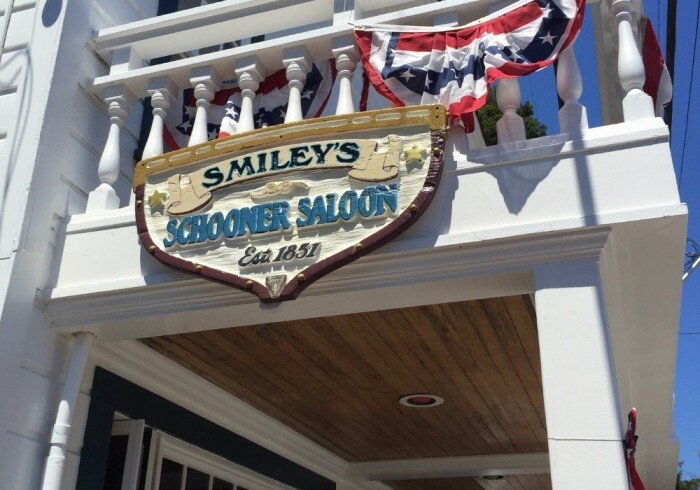 Smiley's Schooner Saloon was established in 1851 and has been in continual operation in the same stalwart and storied building since - and we've yet to find an older bar west of the Mississippi. The saloon is believed to have been built for the energetic young Captain Isaac Morgan who arrived in Bolinas (or Jugville as it was known then) in 1849. Those were gold rush days, days of growth; when one gambled with one's dreams and then watched them either shatter and splinter or be crafted and honed into realities. Smiley's is known among musicians for gigs that come with free beds and a spirited crowd, and to music fans as a place to catch artists like Lukas Nelson, Sam Chase and the California Honeydrops. Check out our social media and website for our music calendar. So now you'll need a place to rest your head; in an outbuilding behind the bar, you'll find Smiley's Sleeping Quarters: 6 private rooms with brand new organic linens and mattresses. While we still have a long way to go, we're happy to report that our rooms are no longer “a warren of stale-smelling rooms hastily constructed behind the town's only bar" as the New York Times called them in their quirky June 2014 article about Bolinas.